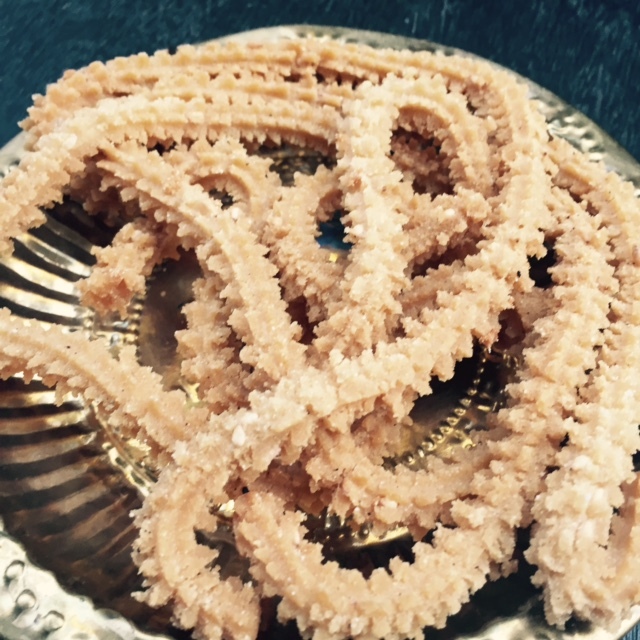 Want to cook some crunchy snack which is comparatively healthier then try this murukku which is basically made from a millet flour and not rice flour. In a broad plate take the above mentioned millet flour and dhal flour. Sieve it well. Now heat oil in a deep pan. To test if the oil has attained the required heat, drop a small amount of this dough to the oil,. If it sinks and rises immediately, it means that that is the right temperature. Now take a small amount of this dough, make it into an elongated shape and stuff it into the murukku press. Close it with the other half of the press and press 2 rounds into the hot oil. Be careful while handling hot oil. Flip the murukku over when it starts to brown.Take out the murukku from hot oil when all the bubbles in the hot oil has subsided. Drain it in a colander.